So what do you do when your budget is limited, your backyard is small and boring, and you long for that cool “Dwell” high end vibe? You do this. Best. Project. Ever. 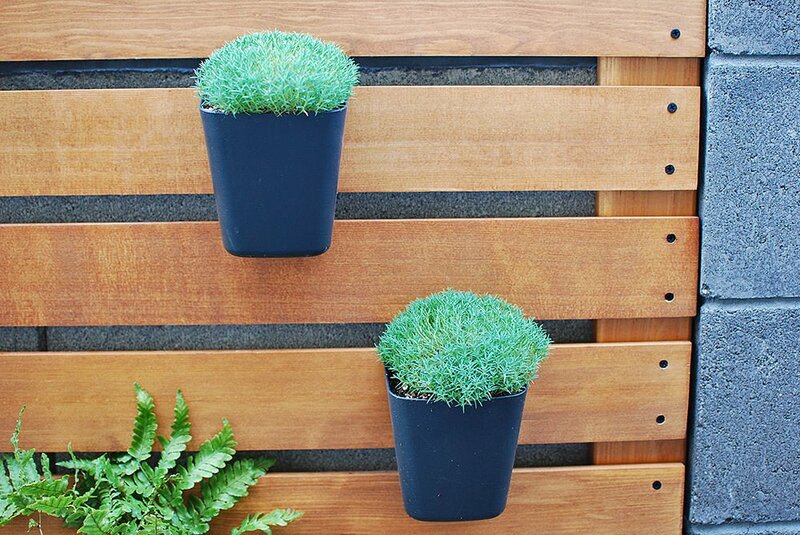 This DIY modern living plant wall just may be our proudest DIY moment yet! And it was easy. Ok, not easy. 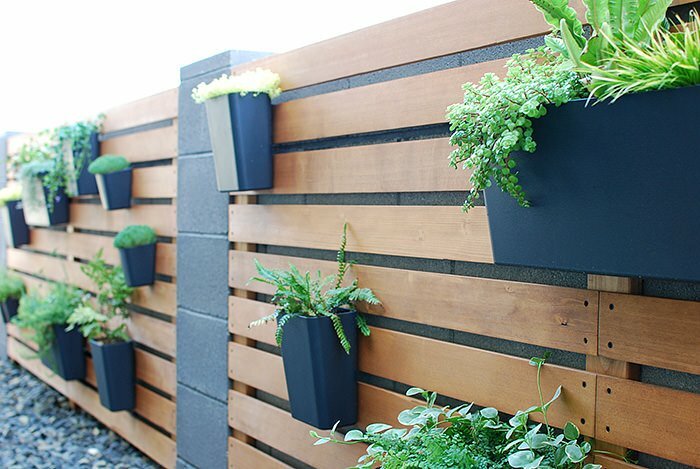 But just because of time and effort, not because this vertical garden DIY was complicated. We LOVE this wall like a toddler loves Cheerios. Yep, that much. So lets start out with what we used to make this vertical DIY living plant wall happen… Note that our wall was attached to an existing block wall. 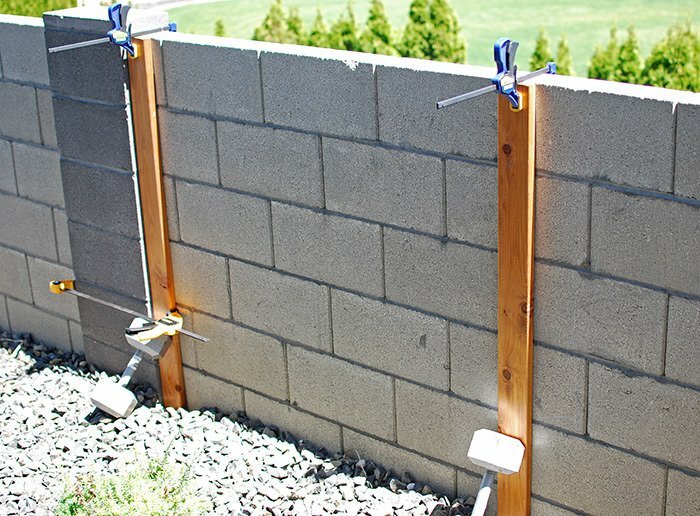 You could still do this same project if you don’t have an existing wall. See suggestions below, in step one. Landscape construction adhesive. 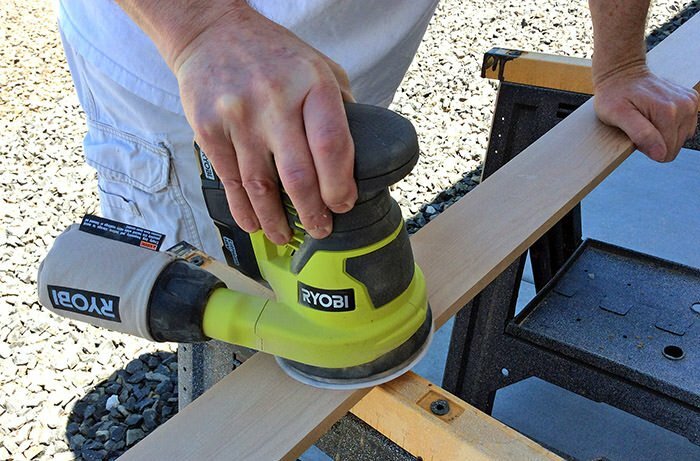 At first we used Liquid Nails brand, but later discovered that another adhesive called ‘Dynagrip’ (Heavy Duty Max) works and holds quite a bit better. 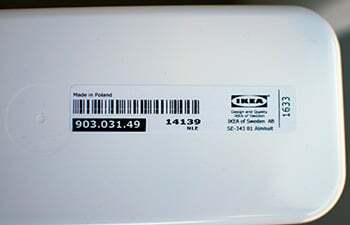 Ikea storage containers (from kitchen storage), different sizes – The smallest ones are called “Sunnersta”. 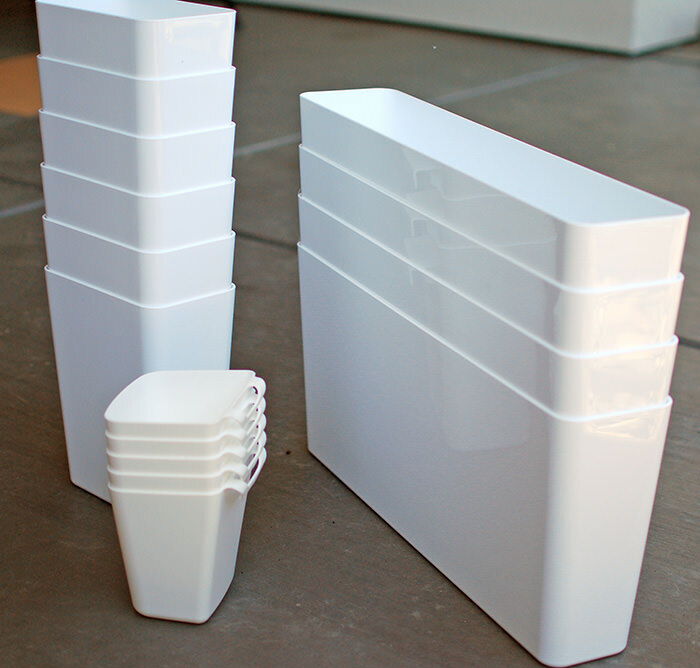 The medium and larger size containers are called “Variera”. 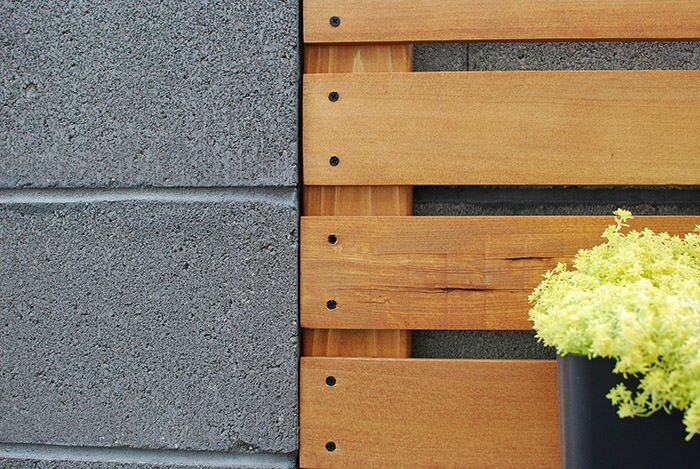 All of these containers have a built in “lip” that worked perfectly for hanging on our wood slats. 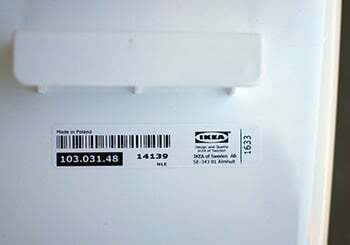 If you have an Ikea near you – get them there. They are very inexpensive. If you don’t, you can get the small Sunnersta, the medium Variera and the large Variera at Amazon. Unfortunately for some reason, Amazon charges quite a bit more. There are likely a range of these kinds of containers that would work, but we know these work perfectly. 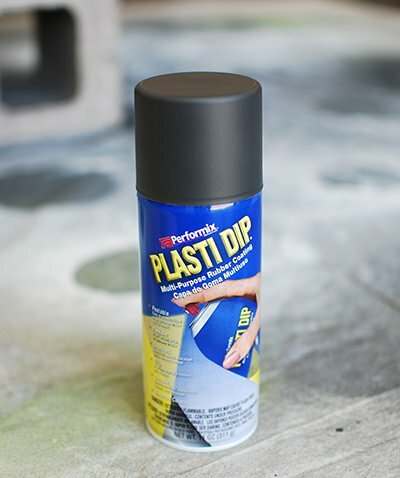 “Plasti Dip” rubberized spray paint. Your choice on color. We recommend a dark grey or black. We used dark grey but we can’t find that anymore. The black would also look good. Step one is to spray paint the containers. This is an optional step, you could just use the white if you prefer. We chose a specific paint made for autos, so we’re hoping it helps them weather better. These are painted a charcoal grey. We also drilled drainage holes in the bottom of each container. Our boring wall, before. 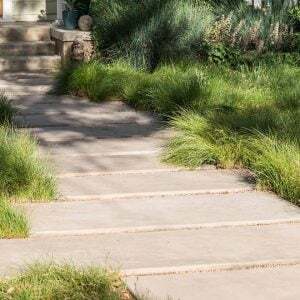 While we attached this directly to the face of our block wall, you could make adjustments depending on your situation, or even build it as a freestanding plant wall by using 4×4 posts and securing them in the ground with fast setting concrete. I can even see this used to cover a chain link fence by placing an upright post on each side, and then bolting them together through the fence. We had our wood cut to length at the home improvement store. Obviously, measurements will be based on how large you want your wall, or what you will be attaching it to. One of the first things we discovered is that some wood takes stain well, and some doesn’t. Our test piece came out blotchy and uneven, so we went out searching for a solution. We got advice on wood conditioners, denatured alcohol, and other such solutions that seemed way more complicated than we wanted to deal with. Then we had someone explain that when some wood is cut, it creates a “burn” of sorts, creating a barrier to the stain. And all we had to do was sand. All? We had 44 pieces for our fence! So we bought a Ryobi palm sander, some hook and loop sanding paper (which is way cool compared to the old style, BTW) and got to sanding. Lucky, for us, a light go over on all sides did the trick! We knew in order to get the consistent look we wanted for this modern style living plant wall , we needed a jig. 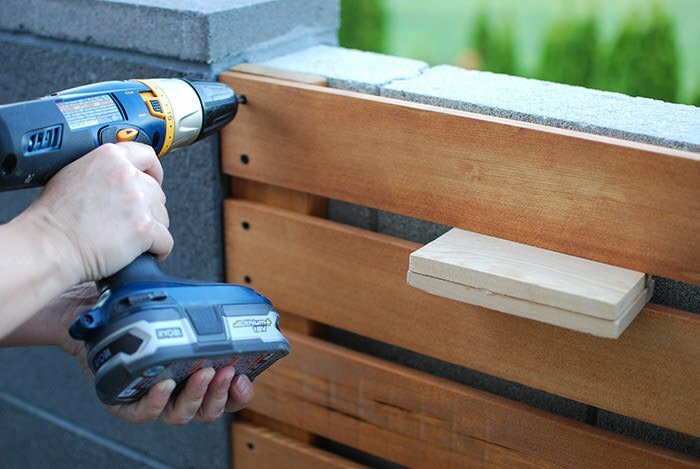 A jig is a simple tool you make out of wood scraps to allow you to repeat the same spacing over and over again, like a template. No need to be fancy, we just put ours together based on the measurements of our wood. 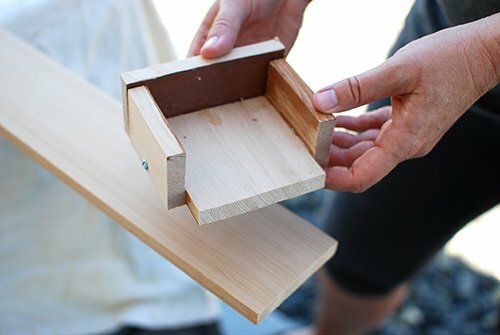 We made a jig to slide over the end of each board for pre drilling our screw holes, and then used counter sinks so that the screws would be flush with the surface of the wood. Once we got it going assembly line style, it went really fast. 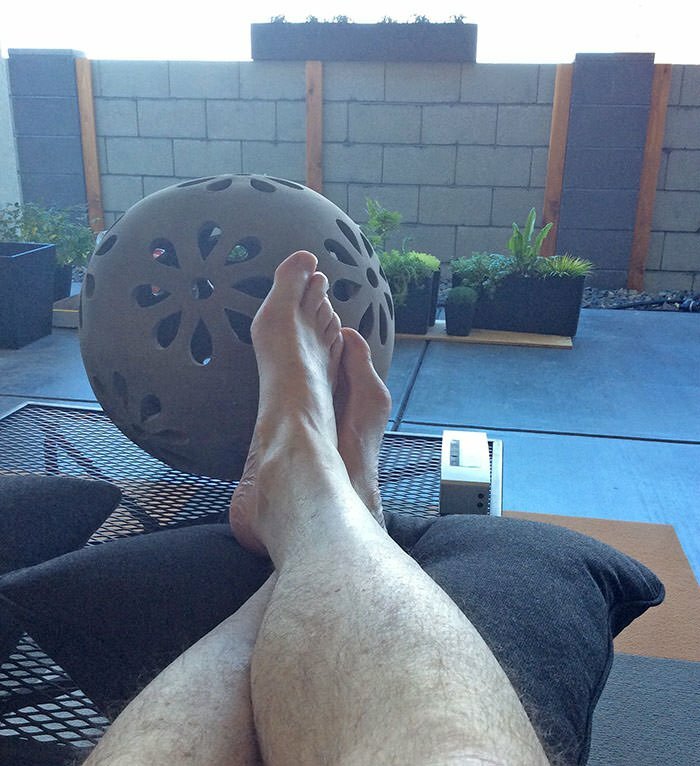 Ok, well in true “it’s hot lets get this done” style, we did not get photos of us staining the wood. 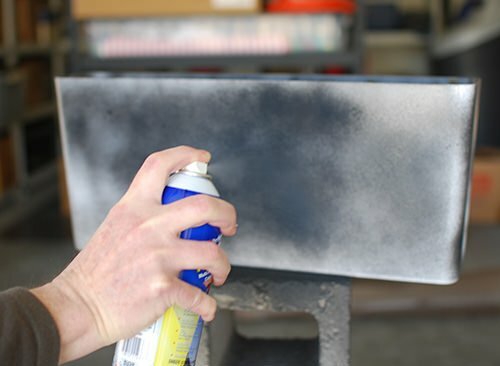 Pretty self explanatory, make sure to wipe off the dust with a slightly damp tack cloth, then brush with a thin layer of the penetrating oil or stain. We found the oil didn’t take much to cover. We bought a gallon for 44 – 4.5 ft boards and had quite a bit left over. 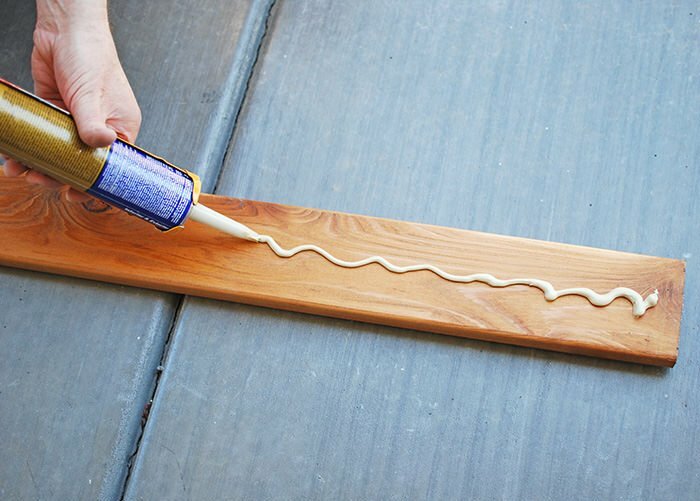 Do a second coat if desired. Let dry overnight. Now we were ready to secure our upright 5/4×4 posts to the block wall. We generously applied Liquid Nails to the back of the post board, then set into place and clamped tightly. Use a level to make sure they are straight. Be super generous with the liquid nails. Do more than we show here (we actually did more than this photo shows) but not too much that it will ooze out the sides. We couldn’t get a clamp onto the awkward spot near the bottom on some of the posts, so we just found some heavy weights to lean against it. This worked for us. Ok, so after letting the posts cure for a couple of days, we got back to it. We started installing the boards 1 inch apart using a spacer we made from scrap. 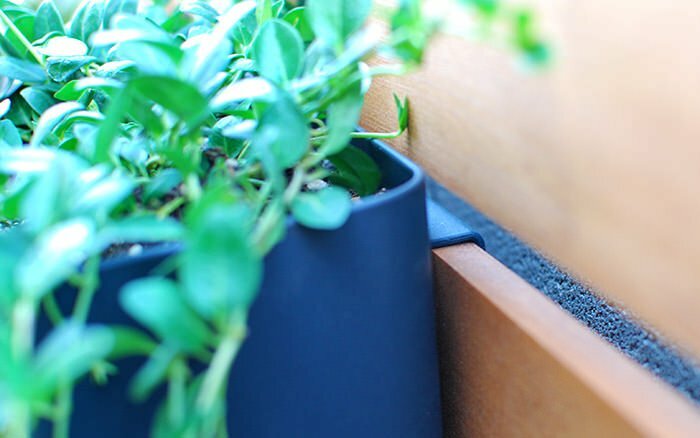 Be sure to check the spacing you choose with the planters you have, and make sure the hooks will slide over the edge of each board once it’s installed in place. Make sure you also use a level on each board. 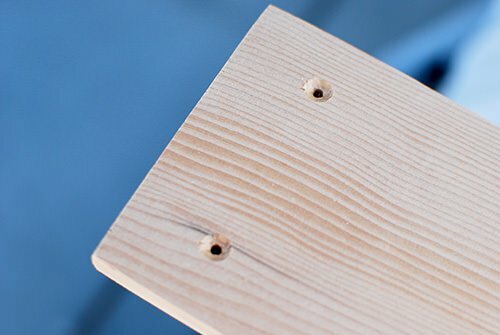 Because nothing is perfect, including the wood, the surface you are attaching it to, or the ground it all sets on, you will get the most accurate placement that way. One thing that ended up being pretty important for the modern look we were going for was the black screws. So after finishing the living plant wall around 9 pm, we couldn’t wait to start hanging planters for the vertical garden. Remember the before? Turned out amazing, right? 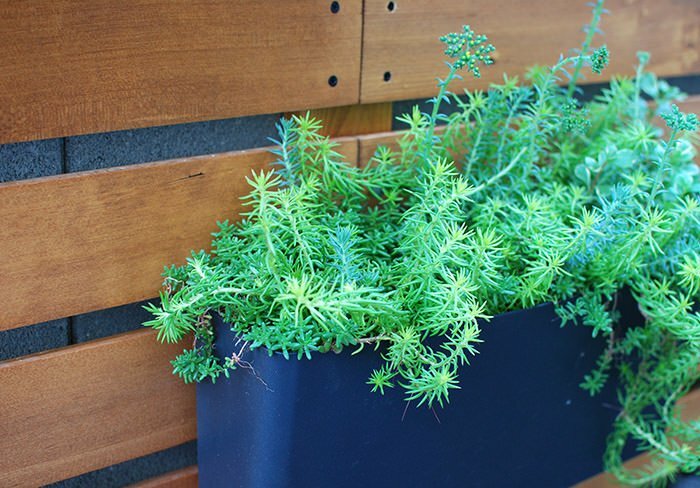 Plants include creeping myrtle, various Thyme, “Limelight” sedum, Bulgarian pinks and Autumn and Harts Tongue fern. These are a type of Dianthus called Bulgarian pinks… We love the compact little mound they grow in! Mixed sedums, mostly of the bright green “Angelina”. 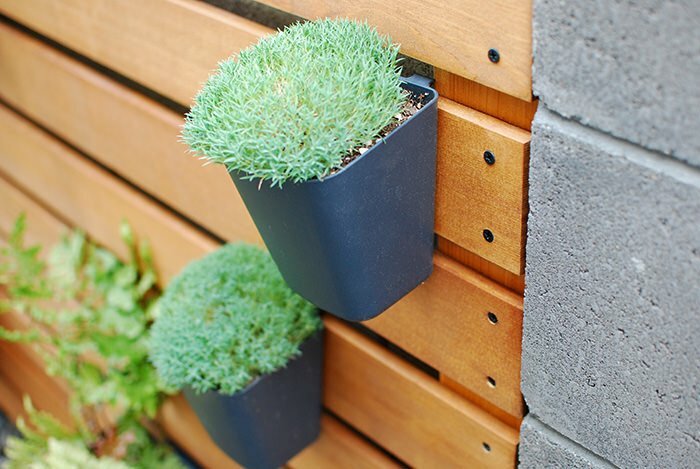 Believe it or not, these plants are all evergreen so the wall will look great all year round. More coming soon in our patio reveal post! Hope you love this Living Plant Wall project as much as we do! Got questions? Share in comments! We think you will also want to jump right on over to our posts on Built In Planters and Privacy with Plants! Update: This wall has made it through two snowy winters now with very little problems! We did have it pull away from the wall once, and we used a new adhesive to reattach it called ‘Dynagrip Heavy Duty‘. This one seems to hold the weight better. We simply squeezed adhesive down into the area that had pulled away, then re clamped it back to the wall for a couple of days. It’s been great ever since! What is your location? 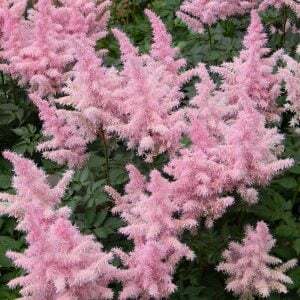 You mentioned herbs would be green year year round..I am in mid-west..
We are in the high desert are of the inland NW in Washington state… so the dry side that gets snow, lol.. And 90% of the plants made it through the winter at least semi evergreen! Thank you! We bought the same containers from Ikea, but they have little pertruding pieces under the “hook” that keep them from fitting over the 1” slats. Did you have this problem? If so, how did you resolve? Ours did too, as we decided on how far apart to put the slats, we adjusted so the “hooks” would just barely slide over. The protruding piece didn’t seem to interfere with the width of our boards… I wonder if your boards are too thick and you re having a problem getting it to clear, if you could grind the little protruding pieces off with a Dremel tool or saw? You won’t see them anyway… Let us know how the wall comes out! Can you tell me, if you remember, what stain brand and color you used on this project? We used PPG Timeless Wood Stain in Cedar, it is in the supply list on the post as well! This is a lovely idea for planting cooking herbs so as not to take up room in the vegetable garden. Great utilization of space!! Thanks for sharing. Thx Michelle! Everyone who comes over loves it as much as we do! Could you please tell me what size screws and what size countersink bit you used for them? 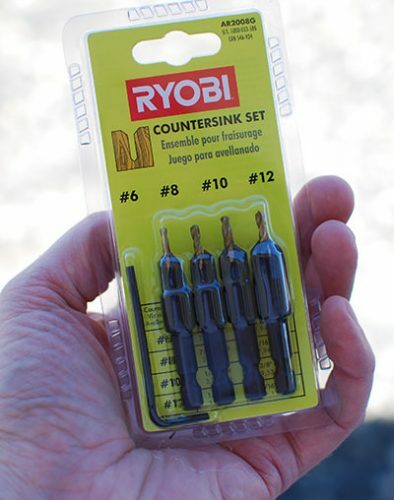 I have size 8 black coated deck screws, but not sure what size countersink bit I need…do I get a size 8 or go smaller with the size 6? Help! My wall will not be exactly the same as yours…my wall is taller and longer, so I’m using 1×6 boards..
We had to experiment with a couple sizes to get the look we wanted and the amount of flushness (is that a word?) 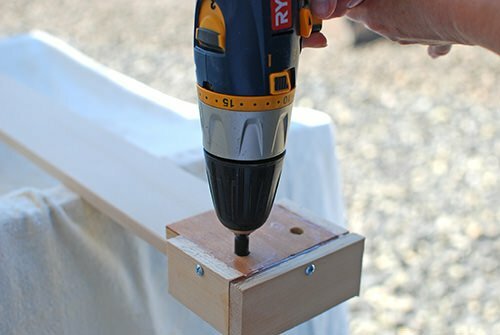 we were looking for… We bought the countersink bit set from Home Depot, and they told us that if they were the wrong size we could return them… Sorry we count be more help, we do recommend trying it out on a scrap piece first! Let us know how it turns out! I live in Arizona where everyone has ugly block walls! 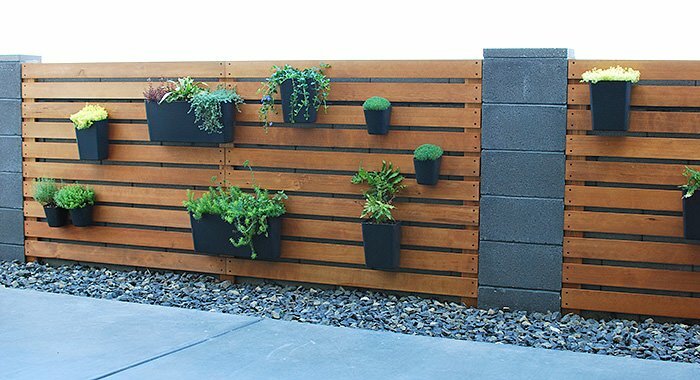 I have one area where I have been wanting to install vertical wall planters. You just solved my problem! I may end up doing ALL of my walls like this, but I’m starting with 2 sections that will be behind a future hot tub.. Loved this wall! Been looking for a new look for my back yard. May have just found it! Thanks! I love this idea! I’m renter but I have a horizontal slat wood fence this will work great on! Just one question…did you drill holes the bottoms of containers for drainage? Hi! First of all; best looking plant wall I have EVER seen! Wow! One thing, the instructions talk about 4×4’s but it looks like 1×4’s for uprights in the pics. Am I missing something? (I ask this mainly because I want build this ASAP!!!! LOL! 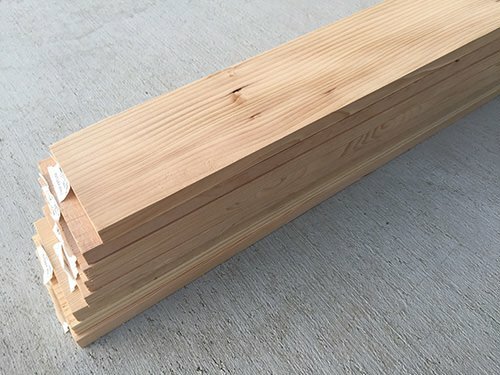 We are going to clarify this in the directions, but what it says is 5/4 (as in five quarter, thats what they call 1 1/4 inch wood) by 4 inch lumber. There is no number of boards in the supplies because everyones measurements will be different. Hope that clears it up! Did you drill drainage holes in the containers for the plants? Did you put any holes in the bottoms of the containers for drainage?